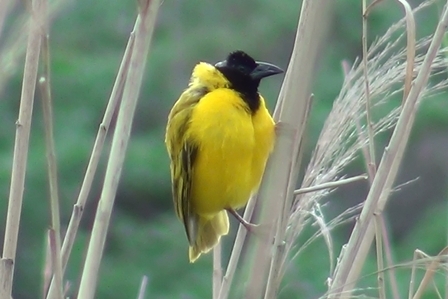 Many weaver species have been introduced to various parts of the world. Their effects on local birds have not often been studied. In this paper, the authors conducted fieldwork at four sites in Portugal from April to June 2012 to collect data the introduced Yellow-backed Weaver (Black-headed Weaver) Ploceus melanocephalus during the early stages of its invasion. This weaver has been suspected of competing with two ecologically similar native species, the Great Reed Warbler Acrocephalus arundinaceus and the Eurasian Reed Warbler A. scirpaceous. However, their work does not support the previous anecdotal suggestions of competition. They do recommend continued monitoring of the impacts of Yellow-backed Weavers, as negative impacts may occur when the weaver reaches higher population levels. A full paper on these findings are being prepared.